It was Friday, March 15, during the opening reception of an exhibition titled “Still Here: Torture, Resiliency, and the Art of Memorializing.” The artists with work on display had been commissioned to submit design proposals for a permanent public memorial that would pay tribute to the victims of Jon Burge. Burge was the former Chicago Police Department commander who, along with white officers under his command, tortured more than one hundred Black men, women, and boys between 1972 and 1991 at his Area 2 police station in Pullman. Many of Burge’s victims spent years or decades in prison for convictions stemming from coerced confessions; some remain incarcerated today. The public memorial is one component of a historic reparations package passed by the city in 2015, which marked the first time an American city had given reparations to victims of police violence. The ordinance included a community and health center for torture survivors in Englewood; a formal apology from the mayor and members of the City Council; financial compensation, college education, mental health services, and job assistance for torture survivors and their families; and the inclusion of Burge’s crimes in the Chicago Public Schools eighth- and tenth-grade history curricula. The memorial is the only element of the reparations ordinance that has yet to be realized. 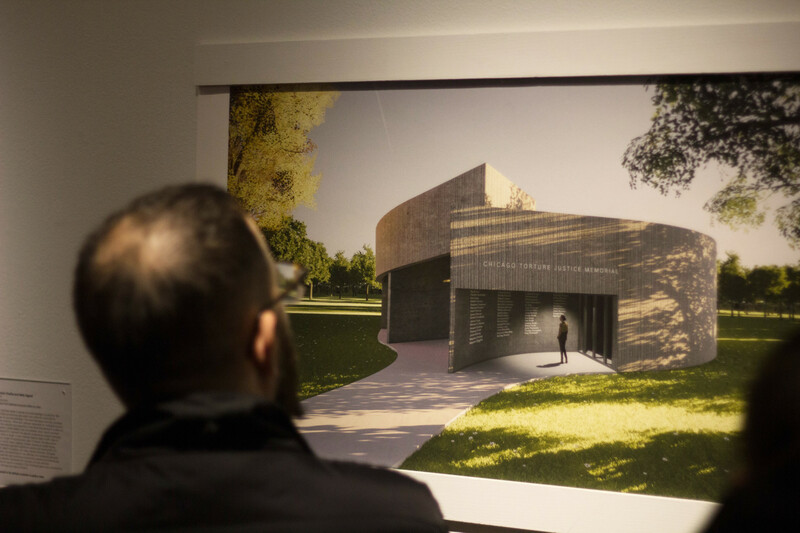 No site has been designated for it, nor has the city granted funding for it, but Chicago Torture Justice Memorials (CTJM), the grassroots group of activists and torture survivors who fought for years for the reparations, has continued to push for the memorial. At the end of the spring, one of the six designs will be selected by a team of jurors comprising “torture survivors, artists, community activists, cultural workers, architects, educators, and individuals in the philanthropic community,” according to Arts + Public Life, the UofC organization that runs the Incubator. The reception began at 6pm; twenty minutes later, the gallery was packed as visitors milled around studying the models of proposed memorials that were mounted on pedestals in the center of the gallery. 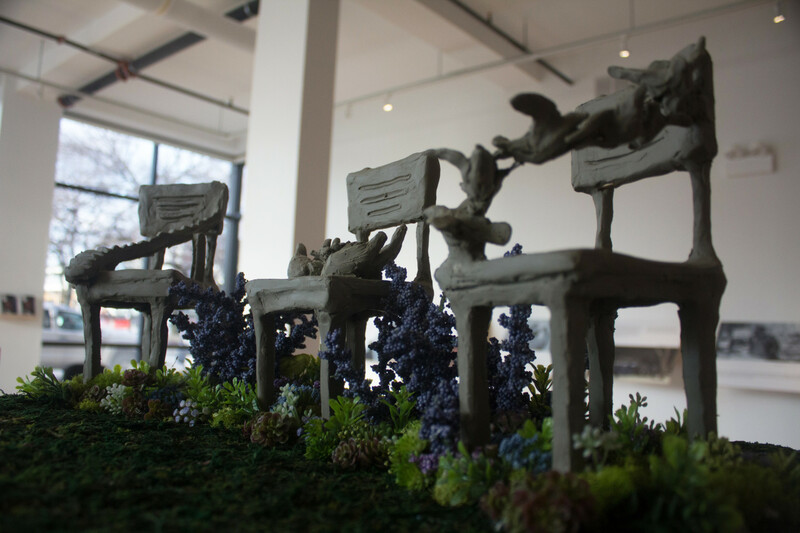 The six artists commissioned were Monica Chadha and Nelly Agassi, Juan Chavez, Sonja Henderson, Andres L. Hernandez, Preston Jackson, and Patricia Nguyen and John Lee. Their designs encompassed a range of architectural styles and concepts. 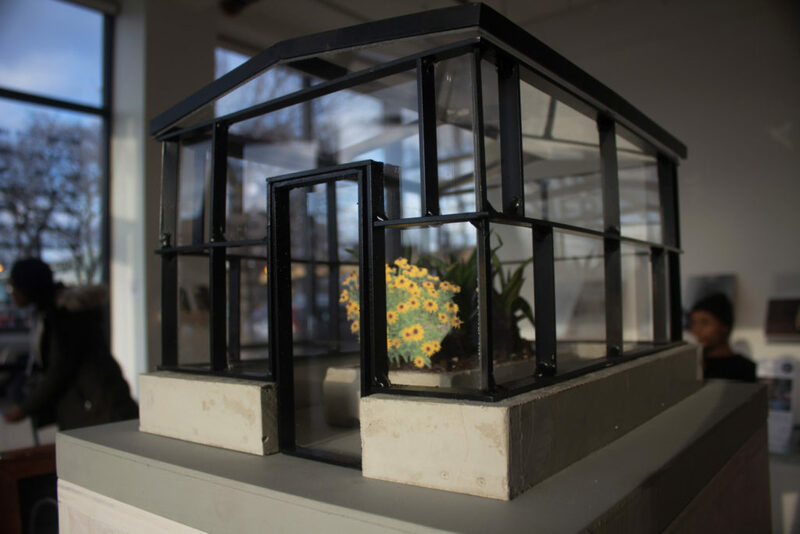 Juan Chavez envisioned a greenhouse-like glass structure with aloe vera plants in the center—a symbol of healing—and black-eyed Susans, which represent justice. Sonja Henderson’s design featured rows of chairs, one for each known torture victim, arranged in a circular pattern around a central square with the perimeter of a prison cell. Hannah Jasper, Arts + Public Life’s exhibition coordinator and the curator of “Still Here,” told me that some motifs, such as the chair, resonated with many of the artists who submitted designs as well as with the torture survivors and their families, who also gave their input. Another common theme was the site as a place of healing and moving forward. “They wanted it to be a place of reflection and peace for the survivors, and you can see that,” Jasper said. Andres Hernandez’s memorial was the most conceptual of the group. Titled “Evidence (Heard in the Light),” his memorial takes the form of an annual day of remembrance, to be observed at large, central locations such as Daley Plaza as well as each of the twenty-five CPD precincts. He also hoped that the day would resonate with the worldwide fight against torture. “The idea is to use light and sound to actually gather people around to tell their stories of survivors that we know of, but also people who may have been torture survivors from other countries or areas that we know nothing about, that may have nothing to do with Jon Burge,” he said. At 6:30, visitors turned their attention to the front of the gallery, where the exhibition’s directors at Arts + Public Life recognized the artists, and Alice Kim, an organizer and co-founder of CTJM, spoke about the group’s ongoing struggle for justice and the fight for a public memorial. Joey Mogul, an activist and attorney with People’s Law Office who has advocated for the torture survivors for the past twenty-two years, echoed Holmes’s call to action. “Still Here” will be on view through April 26 at the Arts Incubator, 301 E. Garfield Blvd., with free admission. Companion programming at the gallery will include workshops meant to involve the community in the movement for the public memorial. On Wednesday afternoons through April 26, survivors will be in the gallery to share their thoughts on the exhibition. Helena Duncan is a writer based in Hyde Park. This is her first piece for the Weekly.